Apparently, this overcharging incident has been circulating in the email circuit for quite some time already before Lexandria forwarded it to me. Initially, I thought it was one of those food disasters pictures like a rat's head in the bowl of porridge or a finger tip in the fried rice type. This, in my opinion, is worse for the earlier examples were accidents (assuming not an act of deliberate sabotage) while this act of price gouging is premeditated. 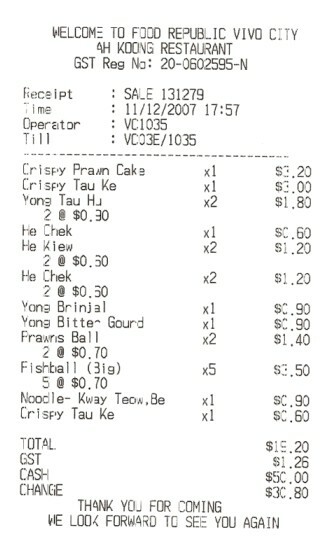 How the hell can a bowl of YongTauFoo cost $19.20??!! Food court leh.... you think this is Mandarin Hotel har? Cripsy Prawn Cake for $3.20??!! Really Kill People Put Fire man!!! Surely there must be a mistake? What did the price list on the store front say? If the price list on the store front is the same as that on the receipt then ok fine, perhaps this person took it for granted by not checking the prices first. So by the time he/she realised kena ketork by the stall, lan lan must pay cause it was his/her own fault for not checking prices first. Otherwise, I would feel that there is the element of fraud in there and had it been me, I would just shove the YongTauFoo back to the stall and refuse to pay. So to those who may be heading to the Food Republic at VivoCity, do swing by Ah Koong Restaurant and take a look at the store. Are the prices really so ridiculously expensive or is this just a misunderstanding. To be honest, I am unable to verify the authenticity of this receipt as it was emailed to me via circulation and as such, I cannot rule out the possibility of the receipt being a product of clever photoshop editing. I guess the sure way is the go to the store itself to verify. Do drop me a comment here if anyone of you is heading over to Ah Koong Restaurant. erm, does a plate of nasi briyani from the same foodcourt, cost $7, counted in the list? speaking of it, i would blog about it.. lucky im not the one that kana..
Gary: At least yours was under $10 but $19.20 for YongTauFoo??!!? WTF??!! I'm sure that is the price stated. You can only blame the fella for being stupid and not asking. I had nasi lemak there for $6 plus bucks too, but that IS the listed price. The shop did nothing wrong loh. If they overcharge, they will lose customers, ain't it? It's very clear. Just order with your eyes open, especially at Food Republic at Vivo. I never go there anymore, because the food at the hawker centres are nicer and much cheaper. In fact, I dislike ALL food courts. Spinnee: So what? They insinuating that everybody else serve unfresh stuff? Chocolate Gal: Well, Bandung Vader wasn't very much of a gal to look at in the first place. RN: You see even $6 nasi lemak is under $10, but a $19.20 Yong Tau Foo?? WTF??!! Yo bro .. the food there is overall very expensive. Republic is sort of an "upmarket" food court. So expect it to be 1.5 times more expensive than normal food court. But that aside, $19 of Yong Tau Foo is still RIDICULOUS!! Haha!! YoungJedi:' Yes, I am aware of such food courts but anything above $10 is just wrong! nasi kandar/briyani for ard 15 is normal even at hawkers la. diu! naeboo: You refering to Ringgit or Singapore dollar?